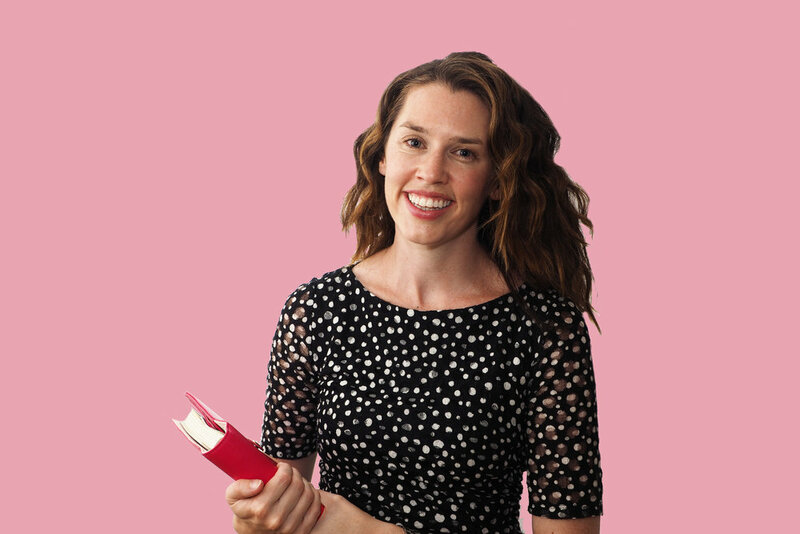 On last week's episode of The Organised You TV, I showed you how we decluttered our wardrobe using 4 easy steps. 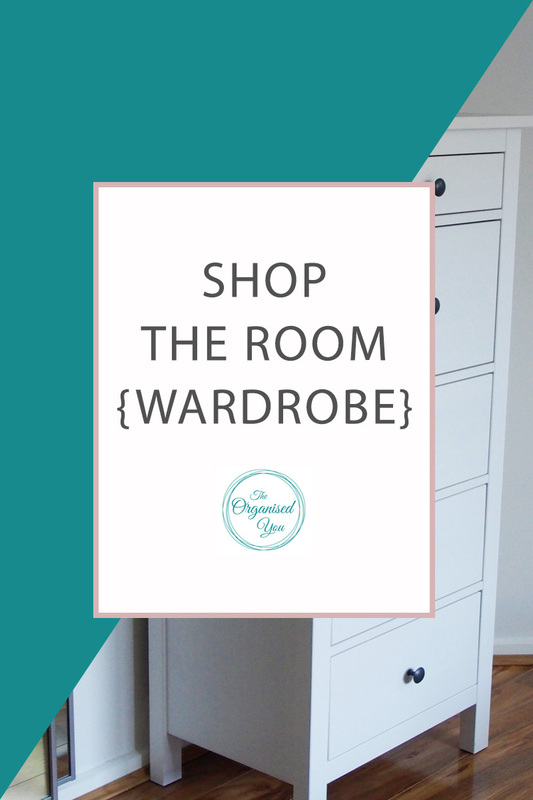 In this video, there was a quick glimpse into our wardrobe organisation, but I thought I'd give you a closer look at the systems we use, as well as product links. 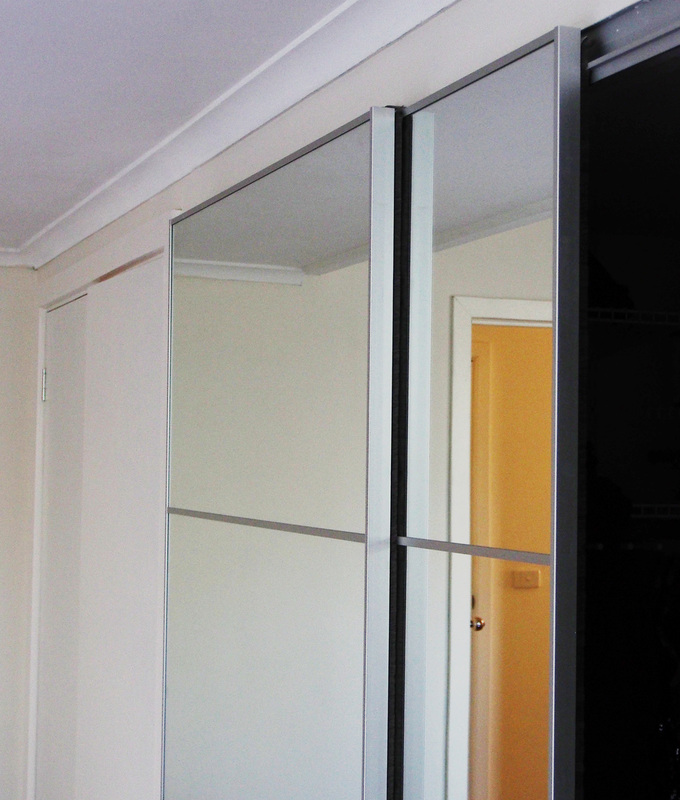 We chose the mirrored doors from the Ikea Pax system to hide away the closet space, and also to make the room look more spacious. And of course, I need to be able to check if I look half-decent in my outfit! 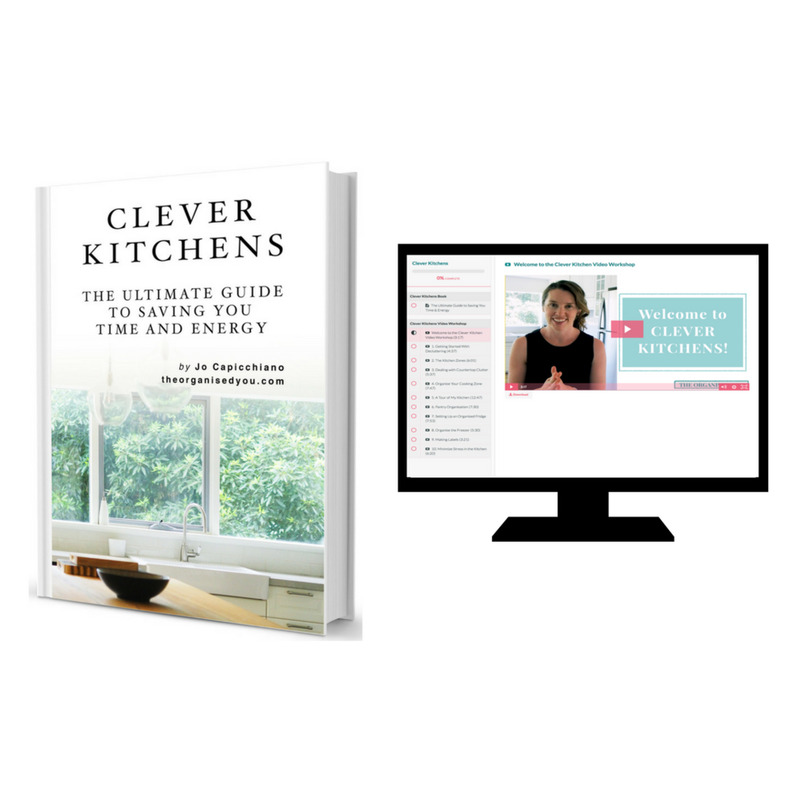 Our whole closet system is a modified version of the Clever Closet system from Bunnings. 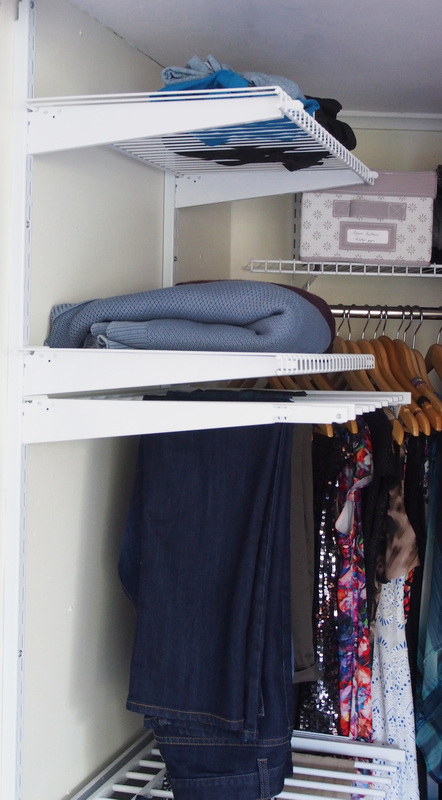 We designed it specifically to suit our closet space, with 4 shelves, 3 rods for hanging - one for long items such as dresses and coats, and two rods for shirts, tops and jackets. Obviously I need more room for all my clothes, so Damian has one rod, and I have 2! What we liked about this system was that you could put the shelves at whatever height you wanted by clipping them onto the track (exactly like our gift wrapping station set-up). I LOVE these pant racks for keeping our pants nice and organised. They slide in and out for easy access, and hold 8 pairs of pants, or 16 if you put two on each hanger, which it does have enough room to do. I only have 1 storage box in our wardrobe at the moment (can you believe?) , but would like a few more for hats and out-of-season clothes. I am searching for ones that are shallow enough to fit on the top wire shelf. The storage box pictured currently holds spare pairs of bathers, and out-of-season gym clothes. This shoe rack is a good option at the bottom of our closet because it can hold a fair amount of shoes, and is extendable to fit more. It can hold a maximum of 12 pairs. I also got this hanging organiser from Bunnings. It's a great storage solution for holding extra pairs of shoes. The bottom pocket of the organiser holds my clutches so it is definitely a versatile product. 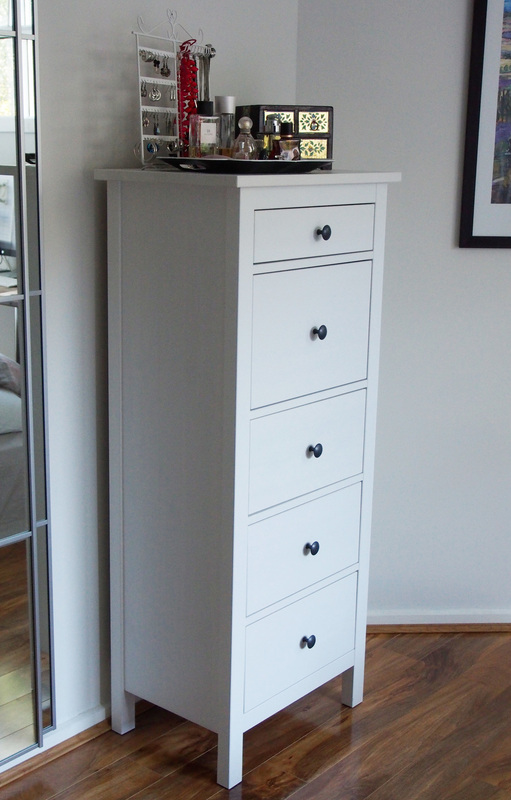 We needed more storage space for things like t-shirts, long-sleeved t-shirts and pyjamas, so we purchased the Hemnes chest of 5 drawers. I like that it is slim-line so it fits this corner space well, but would actually like something a bit bigger. We currently store our underwear and socks in our bedside drawers which is a bit of a pain, so when we finally get around to re-doing my daughter's room into a 'big girl' room (sob! ), I'm thinking of swapping her chest of drawers for ours. It's quite a big piece so hopefully it doesn't overwhelm the space. We'll see! What products do you use to keep your wardrobe in shape? Do you think any of these would help keep your space better organised?